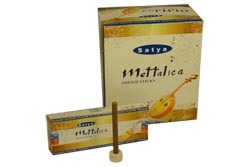 Nag Champa - Mettalica Dhoop sticks are described as a "rhythmic sequence of breath taking fragrance." The blend of traditional Nag Champa combines with flower blossom, but the secret is a slight touch of menthol resulting in an effervescent fresh cooling scent. The unique scent will linger in your memory long after the incense has burnt itself out. Each box has 12 dhoops with a burner. Each dhoop stick is 3" long and burns for about 50 minutes. Remember - One burn and you will return!